This proven, repeatable interview process – when properly applied – could increase your success rate of bringing in outstanding new employees by 200%-300%. The key lies in converting from an unstructured interview approach that is a weak predictor of eventual job performance to a structured, research-backed process – combined with company-specific assessments and tools for interviewers to follow in a consistent way – without fail. How to create a scorecard that quantifiably identifies "A" players you need. How to develop custom interview questions specific to your company and jobs. How to structure your interview to qualify and assess candidates when they all are trying to convince you they're the best. How to "sell" the candidates you want so they are eager to accept your offer. How to measure and refine the effectiveness of your interview process over time. Selling great candidates: 9 ways to "set the hook" so your ideal candidates don't slip away – and enthusiastically accept your offer. The formula for making winning hiring decisions – and the two factors of good judgment you should use instead of your "gut"
How long should the interview be – and can I cut it short early if the candidate isn't suitable? How many candidates should I see before making a decision? How many people should interview a candidate (at one time and overall)? Is there an ideal order of asking questions? How to address negative press or reputation concerns with your company? How many references should we check – and how to get a "real" assessment of the candidate? ResourcefulManager's "The ResourcefulManager Interviewing Framework" Blueprint comes with an unconditional, 100% money back guarantee. 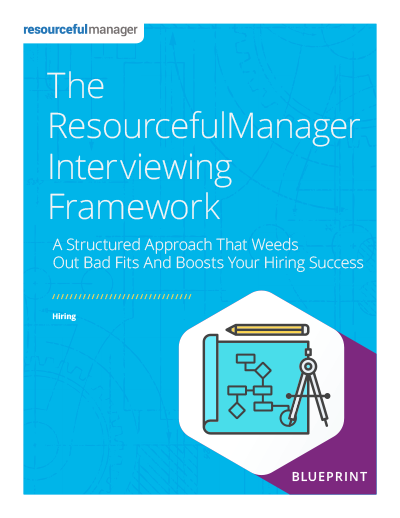 We're confident you’ll find several new and useful ideas to help you navigate the interviewing process, presented in a practical, easy-to-implement format. If you decide "The ResourcefulManager Interviewing Framework" Blueprint doesn't deliver value or simply isn't your cup of tea, just email us at contact@resourcefulmanager.com within 90 days, and we'll process your complete, no-hassle refund in 1 business day or less.